In 2008, CCB fit three juvenile Golden Eagles (Aquila chrysaetos) with GPS-satellite transmitters. The eagles were initially tagged to help inform us on golden eagle movements in relation to 1) electrocutions and line-strikes of eagles in the upper Chesapeake Bay and 2) wind energy facilities in the Appalachian Mountains. 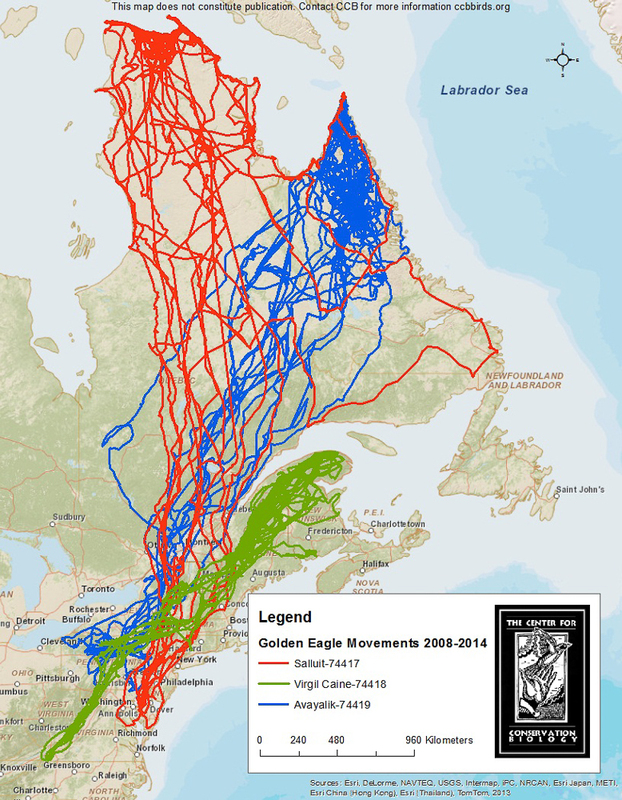 Golden eagle movements for three birds 2008-2014 Map by CCB. In 2008, The Center for Conservation Biology (CCB) initiated a long-term study of Golden Eagles in the mid-Atlantic region. In cooperation with the US Army at Aberdeen Proving Ground, 2 golden eagles were trapped on deer carcasses in March 2008 on the upper Chesapeake Bay. That same month, a third golden was trapped in Highland Co, VA. A 70g GPS-PTT satellite transmitter (Microwave Telemetry, Inc) was fitted to each bird with a backpack style harness. All three Golden Eagles winter in the mid-Atlantic region and summer in Eastern Canada and Maine. Migration routes and timing are being used to inform management and are combined with other golden eagle data collected throughout the Appalachians. Salluit: This eagle summers on the banks of the Hudson Strait in northern Quebec and winters on the Eastern Shore of Maryland in the Chesapeake Bay. The eagle was two years old when captured in 2008. Virgil Caine: This eagle was trapped adjacent to a proposed wind facility in Highland County, VA. The eagle spent summers in Maine and Quebec and wintered in Virginia and West Virginia. We followed this eagle’s movements closely each summer as it approached breeding age in 2011 to determine if it would establish a breeding territory in the mountains of Maine. The eagle visited many historic eyrie nest sites in Maine but was never documented establishing a territory. If documented this would have been a historic event since the species has not bred in the Eastern US since 1997 (MDIFW). Unfortunately this eagle was confirmed dead of unknown causes by New Brunswick biologists who recovered the carcass in a remote forest in April 2013. Read more about this eagle in the CCB news. Avayalik: This eagle summers in Labrador along the Labrador Sea and Ungava Bay and winters in central Pennsylvania. The eagle was three years old when captured in 2008. 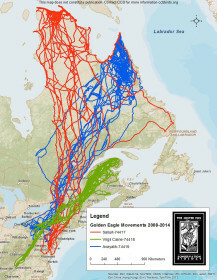 This project has been in cooperation with the Eastern Golden Eagle Working Group, a collaboration of biologists and land managers working toward conservation of the species in Eastern North America. Katzner, T. et al. 2012. Status, biology, and conservation priorities for North America’s Eastern Golden Eagle (Aquila chrysaetos) population. The Auk 129(1):168-176.